Quay West Suites Sydney is centrally located in The Rocks, a 5-minute walk from Museum of Contemporary Art and 7 minutes by foot from The Rocks Markets. 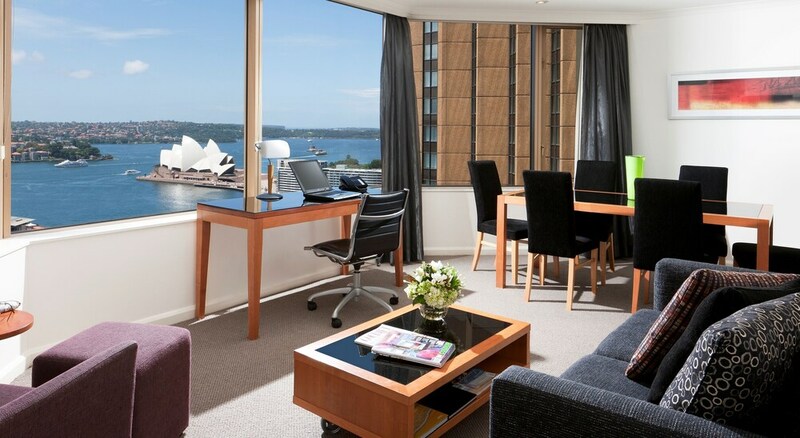 This 5-star aparthotel is 0.4 mi (0.6 km) from Circular Quay and 0.5 mi (0.8 km) from Sydney Observatory. Make yourself at home in one of the 90 air-conditioned rooms featuring kitchens with refrigerators and stovetops. Satellite programming and DVD players are provided for your entertainment, while complimentary wireless Internet access keeps you connected. Conveniences include laptop-compatible safes and desks, and housekeeping is provided daily. Be sure to enjoy recreational amenities, including an indoor pool, a sauna, and a fitness center. Additional features at this aparthotel include complimentary wireless Internet access, concierge services, and babysitting/childcare (surcharge). Enjoy French cuisine at The Quartier Bistro & Bar, a restaurant which features a bar, or stay in and take advantage of the 24-hour room service. Buffet breakfasts are served on weekdays from 6:30 AM to 10:30 AM and on weekends from 7 AM to 11 AM for a fee. In addition to an indoor pool, Quay West Suites Sydney provides a sauna and a fitness center. Dining options at the aparthotel include a restaurant and a coffee shop/café. A bar/lounge is on site where guests can unwind with a drink. A computer station is located on site and wireless Internet access is complimentary. This luxury aparthotel also offers tour/ticket assistance, concierge services, and laundry facilities. Onsite parking is available (surcharge). Quay West Suites Sydney is a smoke-free property. Buffet breakfasts are available for a surcharge on weekdays between 6:30 AM and 10:30 AM and on weekends between 7 AM and 11 AM. The Quartier Bistro & Bar - This restaurant specializes in French cuisine and serves breakfast, lunch, dinner, and light fare. Guests can enjoy drinks at the bar. Open select days. Recreational amenities at the aparthotel include an indoor pool, a sauna, and a fitness center. Group Booking Policy: For bookings of 5 rooms or more, this property charges a 50% deposit, collected 30 days prior to arrival. Full payment is required 14 days prior to arrival. Cancellations or modifications are not permitted once full payment is received. For more details, please contact the property using the information on the reservation confirmation received after booking.